For the first time in a long time I attended Fisticuffs in Weymouth. Please check it out as it is a really good show with gaming at its heart. While there having a look around the traders I spotted a couple of painted gunboats from Britannia Miniatures owned by Grubby Tanks. I know these models well as I have a few unpainted ones waiting in the increasing “to be painted” pile . 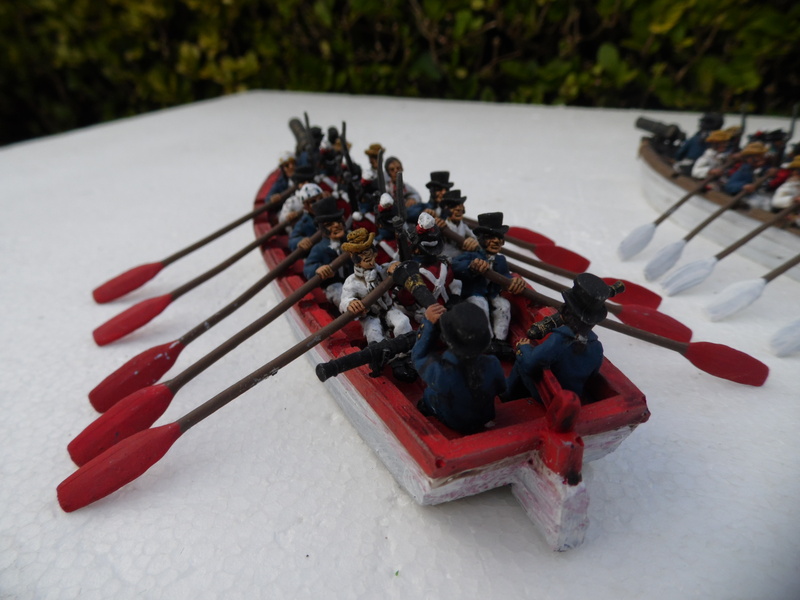 I bought them for the Battle of Crysler’s Farm but have probably thought that the painting time, to paint the 19 figures per boat was better off spent painting regiments. Having looked at and walked away a number of times, the voice in my head finally convinced me that I deserved a treat so ……………….here they are. They suffered a little on the way home due to the everything we bought on what was a fantastic bring and buy. But a few hours and some nice basing will soon have them ship shape. 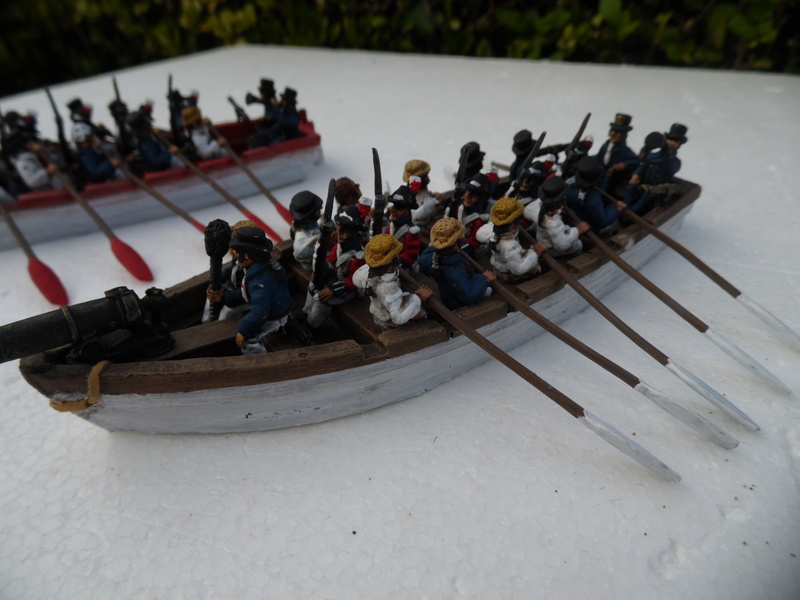 They will then be ready to provide supporting fire from the British right flank on the River. 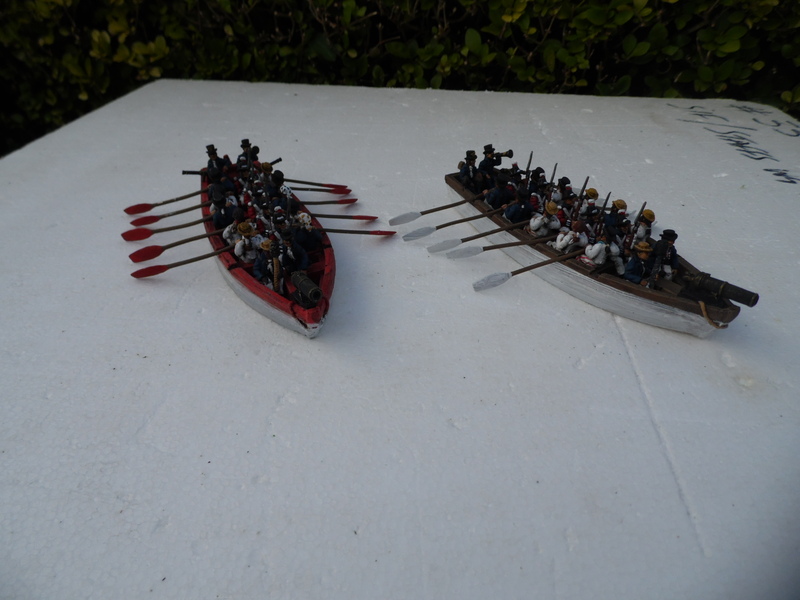 The problem is that they have now sparked an idea of 28mm Great Lake Naval battles! 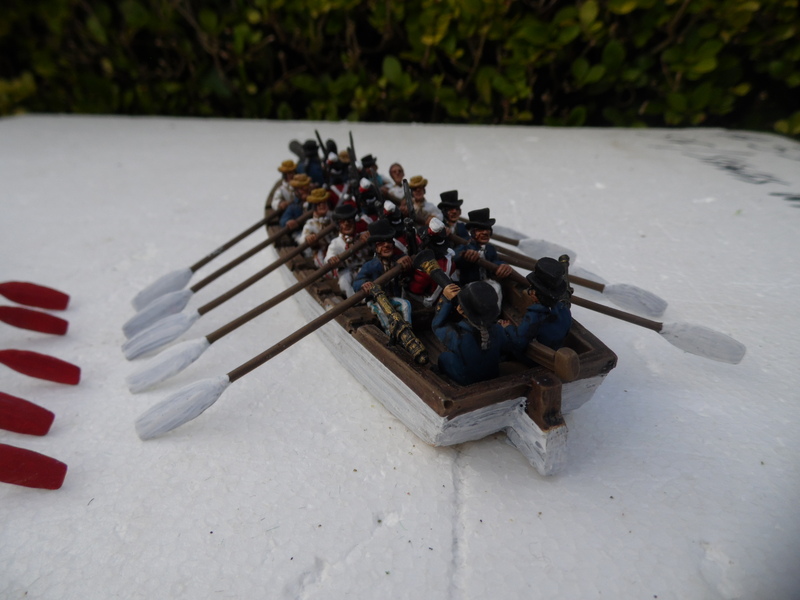 My old mate Brian, an ex marine (reliably, his words) informed me that the oar blades are different colours due to which watch the boat belonged to, Port or Starboard. I love interesting facts like that. Here some pictures. They are not on ice, just that I thought the detail may have been lost on a green terrain tile and I could not find a blue cloth. As mentioned in my last blog, I have had a few months away from gaming but I have been busy painted etc. 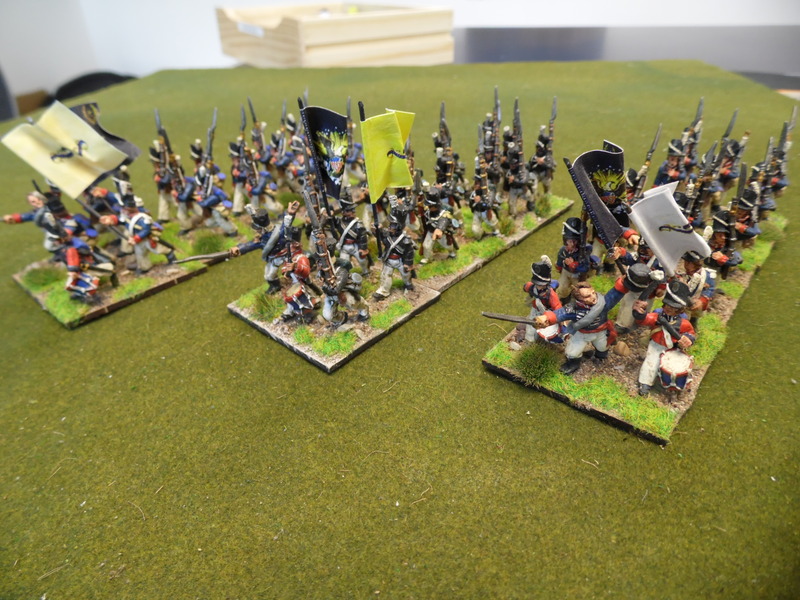 Mostly it has been for my new era of ACW but I have also managed to finish a few units towards my slowly growing United States army for the War of 1812. Here are a few picture of the finished units. They are all Old Glory miniatures. These will form part of the core American forces for the Battle of Crysler’s Farm. See previous blogs. the site offers a couple of National flags, a regimental flag in buff and a speculative regimental flag for the 1st rifles. The National flags were pretty standard as far as I have found out but they also carried a regimental flag (a bit boring if you ask me) in one of three colours; Buff, White or Yellow. I have not found out how the colours of these flags were chosen or awarded to which regiments. Anyone know? I added regimental flags in yellow and white. All I have left to do is to tough in the edge of the flags. Here is another scenario for the War of 1812, hope you enjoy it. The British forces were charged with creating a diversion to the invasion of New York from Canada led by Lieutenant General Sir George Prevost. Major General Robert Ross was the commander challenged with this. One of the positive points was that, following the defeat of Napoleon it allowed Wellington to release a large number of his seasoned troops to be sent to North America. The down side was that at the start of the battle many of the troops had only spent a few days ashore stretching legs etc having been cramped up on board for 3 months. In Washington there was confusion as to where the British were intending to attack. Would they head for Washington, strategically unimportant but the Capital or Baltimore with its commercial targets including boatyards? Which to defend? The British enter along the road marked B In any order Player wishes. 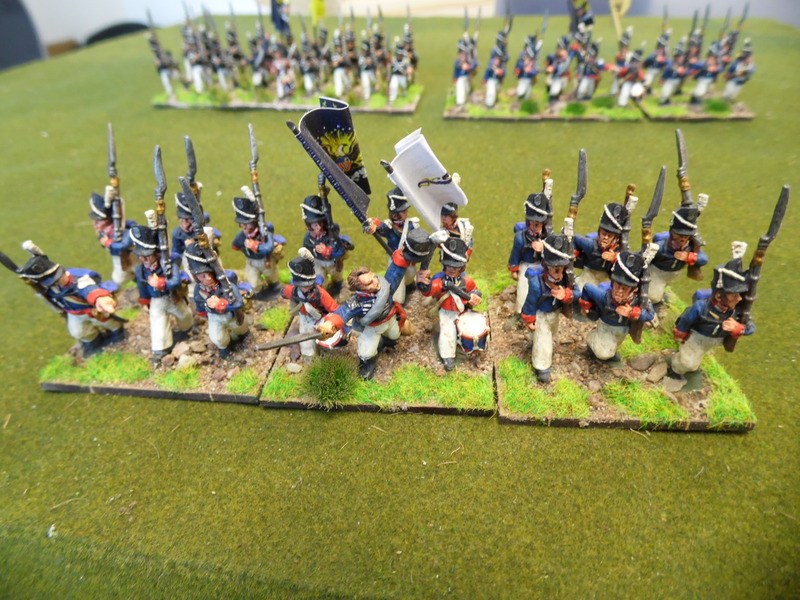 Smith’s Brigade – South of the Thornecliff’s creek. The independent units – Anywhere to the west of the Potomac. The Potomac is fordable along its entire length although at 1/4 speed. Any unit firing or fighting while in the river is treated as if shaken. This does not apply to morale tests. Bladensburg is a 2 square town with each square capable of holding 2 regiments of infantry for defense. See rules. To represent the better level of command each British unit and commander will have an activation card. The Americans suffered from Politicians interference in their deployment. This resulted in many units not sure who their field commanders were. To represent this only American commanders , Independant units and the 2 batteries of field guns in Smith’s command have activation cards. British have to break 50% of American Units to claim a victory with a loss of no more than 20% of their own. The British were desperate to get to Washington so they have 12 plus D6 turns to achieve. Once this number of turns is reached add a End Of Game Card to the deck. The game continues until this card is drawn. Must exit Washington road with 2 units that are not shaken and hold road. Americans claim a victory if they can inflict 30% casualties without losing more than 50% of their units. All others out comes are a draw. Hope you enjoy this scenario. Please find below a copy of the unit markers for the Battle of Vimeiro. I think they are self explanatory. You have the ratings for Fire/ Melee/ Morale weapon type and wounds (OOOO) which is for a large unit of 4 strength points. Most have 3 and an S = Shaken. These are coloured in when appropriate so the status and strength of a unit is clear at all times. We laminate and then colour them in with a erasable marker as the game progresses so literally no other paperwork. Wipe clean afterwards for the next refight. I will try to do these markers for all scenarios if anyone is interested. 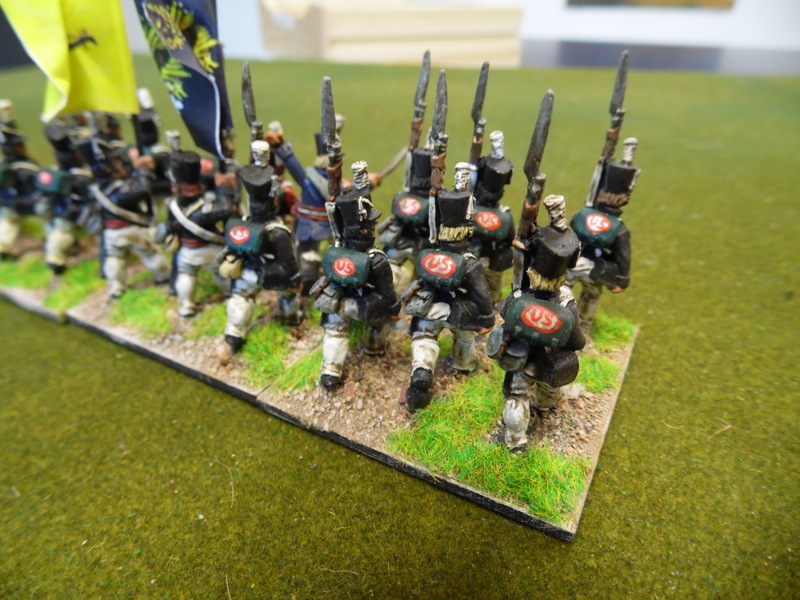 Having wargamed for far too many years to mention, it finally dawned on me how much money and time I have spent rebasing armies or learning a new set of rules. With that in mind I decided a few years ago to find a style of rules that I liked and base all my future rule sets and armies it. I spend a large amount of time and money collecting units. I decided I wanted them to stay on the table long enough for people to see, therefore no casualty removal. I hate the “my turn/your turn” approach. With that in mind I use a card based turn system. I first used this in my Dad’s army game. Depending upon the level of game you are playing, a playing card is allocated to each unit or in larger games brigade commanders and above. This also means turns are not all the same as an end of turn card can come up at any time. They have to be easy to learn. The common approach should assist with this and it is then just about the era specifics. As little paperwork as possible. Most units have a small tab on a base. This contains all the information you need so no other paperwork, in most cases. This could of course be kept separately rather than attached but I think in a demo game it also allows visitors to see which units are representing which. Enjoyable. I am not too serious and enjoy a light hearted approach at times to rules. Have a look at my rocket rules. While they may be a little slow to enact, imagine the gasps as rockets snake across the field. You never really know where they will end up! I like to discuss issues arising. One of the biggest challenges is for “serious” Wargamers is to look past their unit not getting activated and not firing, moving or engaging in melee. I remember in one game, a player arguing that units should always have an action. This came about due to the fact that in the first 3 turns his British artillery’s activation card had not been drawn. What rubbish he argued and most others started to agree after a while. I then raised the point of the British artillery at the battle of Bunker Hill. Not many were familiar with the battle but the British artillery could not fire for a while as the wrong ammo had been made available. This impacted upon their ability to join in the battle at a key moment and affect the outcome. How could you ever build that potential impact in to a set of rules? Most of the players started to appreciate the idea behind the card system. The British player finally supported it fully as Lancers appeared on his flank only to be too far deployed from their commander to be activated. This gave him the chance to form square next turn and live to fight another day. I appreciate it is not for all but I love it. With this in mind I offer my set of rules called KING GEORGE COMMANDS AND WE OBEY. 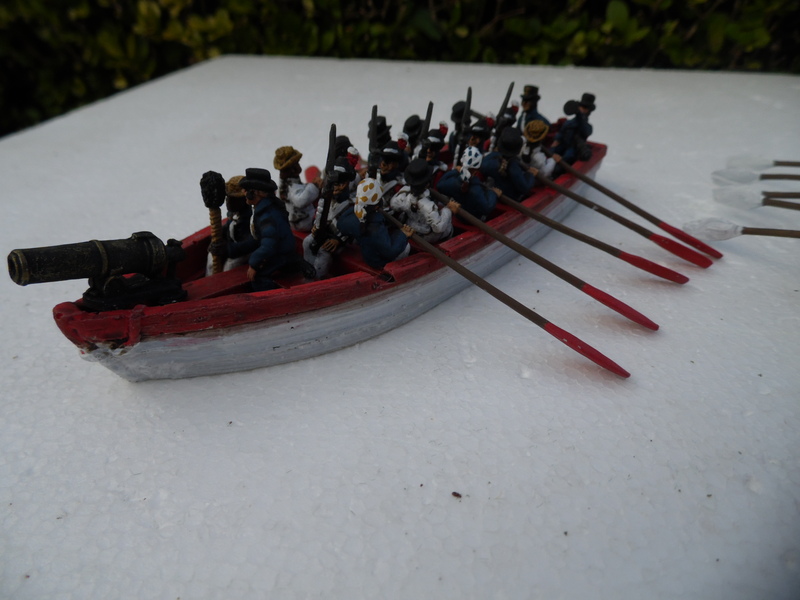 They are suitable for the American War of Independence, Napoleonic Peninsular and the American War of 1812. Some aspects may be familiar and some not so. Ideas have come from so many rule sets I have collected over the years. I hope you find something you like; if not then I hope they encourage discussion. 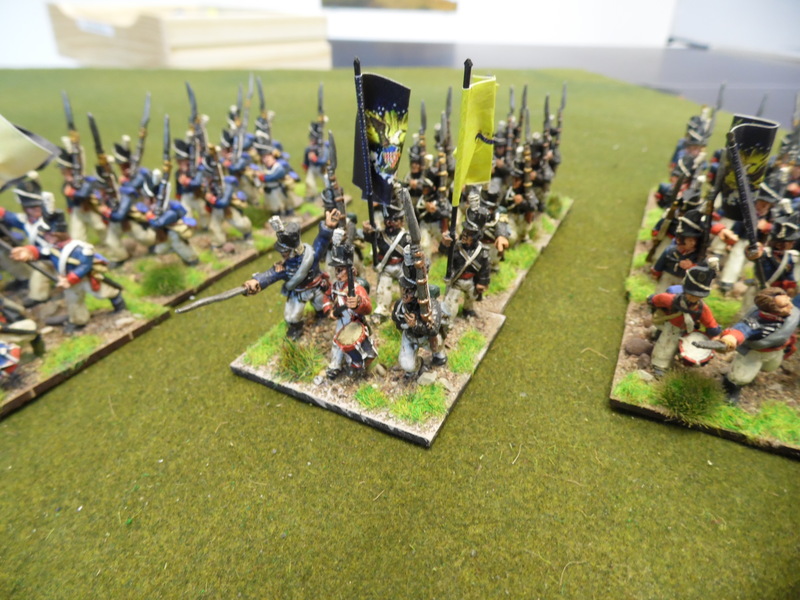 If you would like to see them in action then please come along to Legionary 14, Exeter, on the 3rd of May where we will be presenting the battle of Vimeiro. I will add some more scenarios over next few months. This week I notched up 25 years service with the same employer. I don’t intend to bore you with my employment history but in recognition my employers gave me £500 to spend. Discussions with my wife followed and she said to spend it on myself as I had done “the time”. 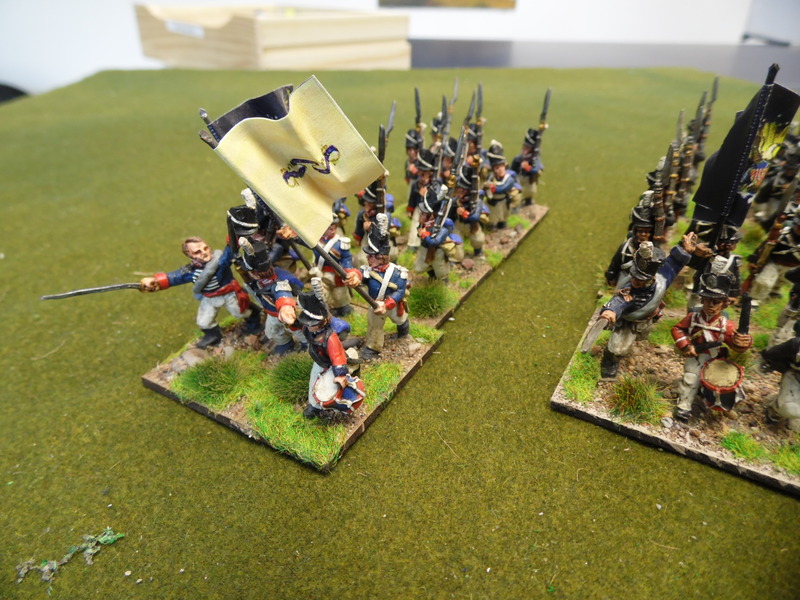 I gave it some thought and came up with the idea of expanding my napoleonic armies. 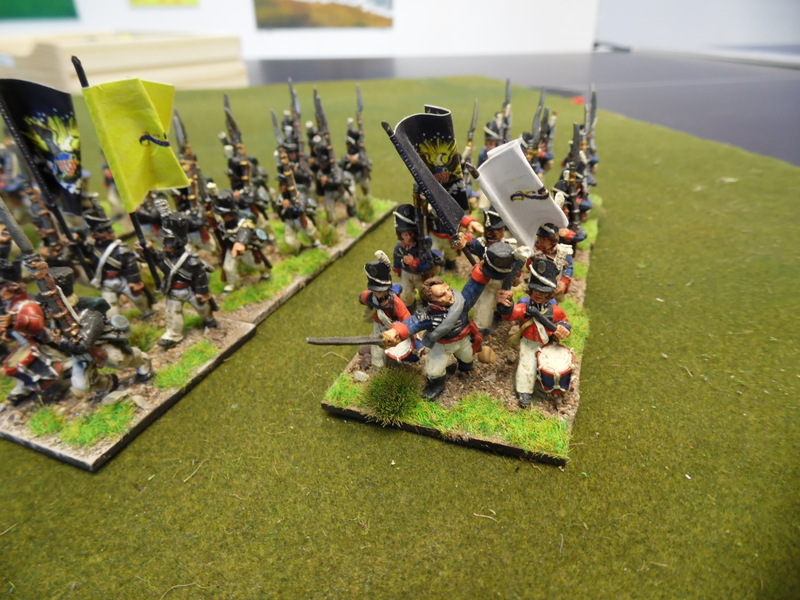 I didn’t want to collect a late British army as I felt I would be doubling up, so it was probably going to be an Austrian and/or early Prussian. Well in the end it was none of these. America 1812 won it. Why? Well it is a small war by European scale which means the £500 should hopefully enable me to buy most if not all of what I need and what a selection of battles and troop types. When starting a new era I normally pick a battle that interests me and select troops for it. Queenston Heights Oct 13th 1812. American invasion of Canada. This battle has a beach landing, regulars against militia, good officers and bad ones with lots of what if options. Battle of the Thames River. October 5th 1813. Larger American force pursuing a mixed British force including Indians. Battle of Crysler’s Farm. November 11th 1813. 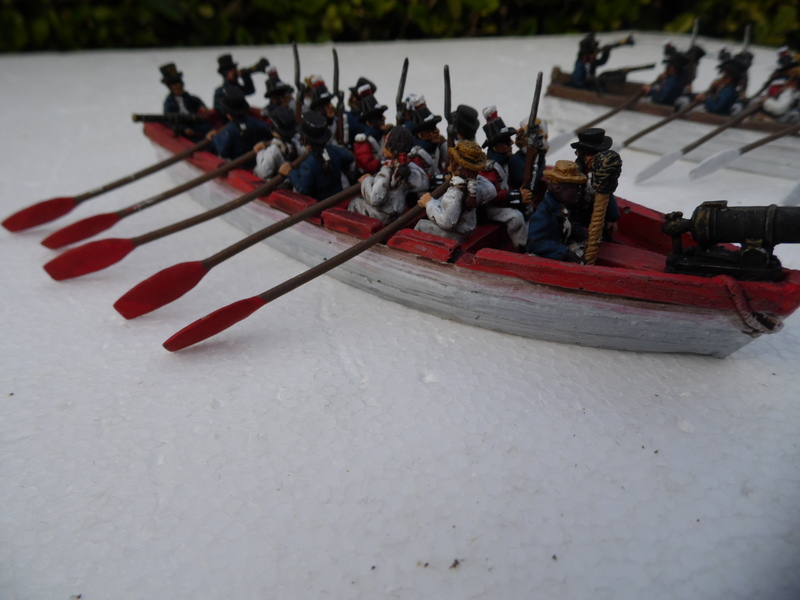 Large American force against a smaller mixed British force of Regulars, Militia, Indians and gunboats. Battle of Lundy’s Lane. July 25th 1814. An encounter battle with both sides getting reinforced, limited visibility and all the major complications that can bring. August 24th 1814. Crossing the Potomac and entering Washington the British burnt down the Whitehouse before withdrawing. 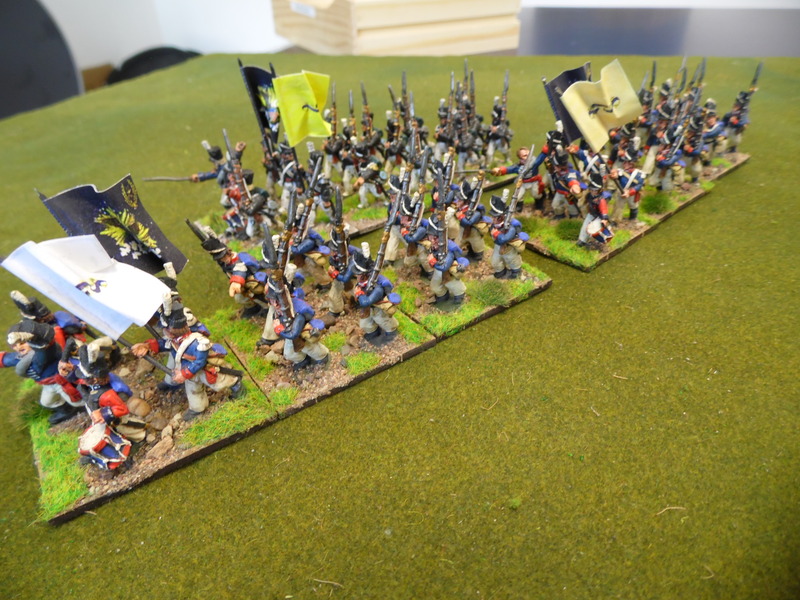 This battle offers regulars, militia, marines, Dragoons and British rockets!. Huge amount of what ifs. Battle of New Orleans. January 8th 1815. Last ditch battle of the war. Regulars, militia, West Indian troops, Free Black Militias, marines, riflemen, a large defensive wall made of cotton-bails and swamp. A battle with huge options. I will give a detailed scenario for each soon. I looked at Foundry as I just love them, normally. This is a very disappointing range due to size comparison with their other Napoleonic ranges but more importantly pose variations. Most options only have one pose, so poor in today’s market. I also suppose the price doesn’t help, £1.50 a figure. Knuckleduster Miniatures. What a fantastic range. They offer nearly all the figures required apart from artillery pieces. The only issue is that they are only available in the UK via Caliver Miniature. Speaking to them they had no stock to speak of and no deals. Old Glory. Rang the supplier to discuss. Wow, what a great supplier. Spent time with me discussing the range, the era and their offers. I spent a few days reviewing pictures and have now placed an order. Will update when they arrive.